Augustine’s question is interesting, but I think that his question is flawed. I think that the past lives in the present much more than we would like to think and that our future, though unwritten can unfold in a multitude of ways and possibilities. As a historian myself I value the past and seek answers and wisdom from it to use in the present because what we do in the present does, for better or worse defines our future. Confucius said “study the past if you would define the future.” He was quite wise, he said to study the past, did he did not say to live in it. 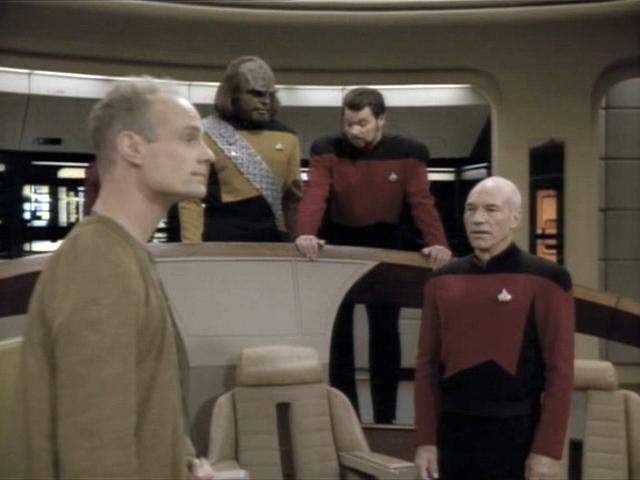 Finally, after other all other possibilities were exhausted, Captain Picard was forced to make a decision and confronted the visitor, who as it turned out to be a thief from the past, using time travel to collect technology to enrich himself by bringing it back in time. Picard makes a comment which I think is pertinent in a time like ours. Since I am a Christian, at least by profession, my faith in that future is in the God who is eternal, the God of love. Victor Hugo in Les Miserables said “Love is the only future God offers.” That is the future that I want to envision. Unfortunently there are many people who claim the same Christian faith that I claim who attempt to return to an imaginary past and to try to legislate that past onto others who do not share their beliefs, if necessarily using the police powers of the state to do so. Such is neither honest because it attempts to enforce a mythologized past on others, nor Christian, because ultimately the Christian hope is focused on the yet to be realized future and not the past, it has nothing to do with establishing some kind of theocratic Christian state that denies rights and a future to all but like minded Christians. The coming year promises to be challenging, and the tensions between those who want to return to the past, especially the predominantly Christian cult devoted to President Trump and making America great again and those who believe in an inclusive hope and future for all will be on full display. As for me, I choose the path of Picard; because my future, and our future, hasn’t been written yet, and cannot be surrendered to those who want to return us to a mythologized past that never existed in history, but which they want to legislate today. My choice in our time is to resist, and to fight for a future that includes everyone.